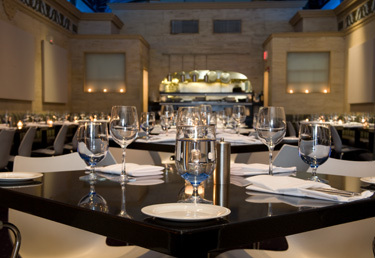 Elegant and informal describes the decor as well as the menu design of Teatro, meaning 'theater' in Italian. Once a synagogue, the original 15-foot high vaulted ceilings are lit in pale blue and elaborately etched with gold. The gold leaf molded ceiling, along with the marble inlaid walls and an open kitchen, add to the theatrical presence of Teatro. "This is one of the hottest hot spots in one of the chic neighborhoods...the food is as striking as the surroundings." "Teatro, the swankiest new addition to the Ladder District..."